Relatively new her on the forums. I have been in the search for a Delta Cabinet Saw recently to replace my Dewalt Contractor Saw. 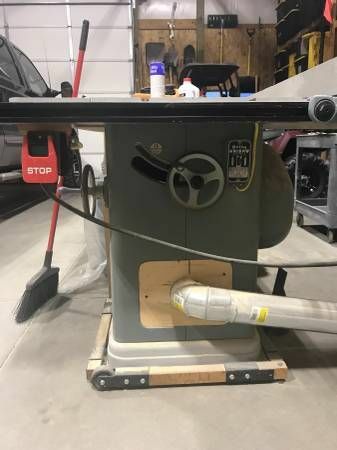 I have had a local saw pop up but could use some help identifying this saw. It appears to be a late 1940s early 1950s Delta Unisaw. I looks to have an extended table with infill. Maybe original 1hp 110/220 motor. And went through a partial restoration. He is unable to find serial number. I could use your help. Trying to talk him down from $600 to $500. Yup – It’s a Unisaw with a R/I motor, mobile base and appears to be a Unifence but can’t really verify from that picture. 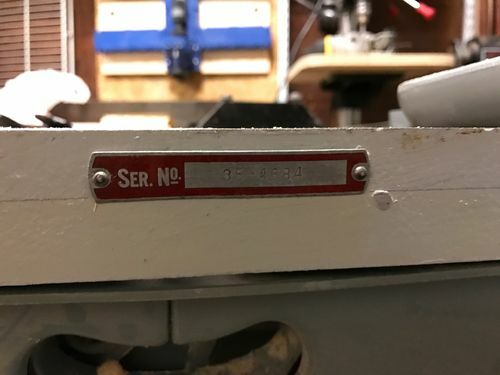 Serial number may be on the tilt angle badge, or under the table on the cabinet either in the front or back. Excellent, thank you. Do you feel that a $550 price is too steep? ...and appears to be a Unifence but can t really verify from that picture. Unifence, for sure. 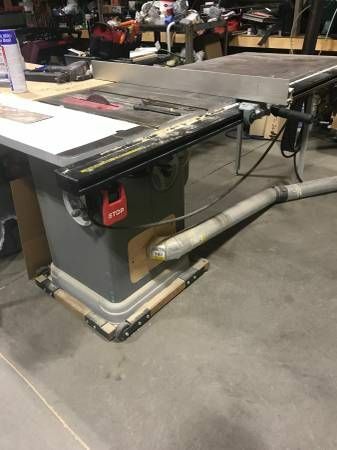 Seems like $550 is reasonable for that saw but it never hurts to make an offer. I think the price is a bit high, but not bad. 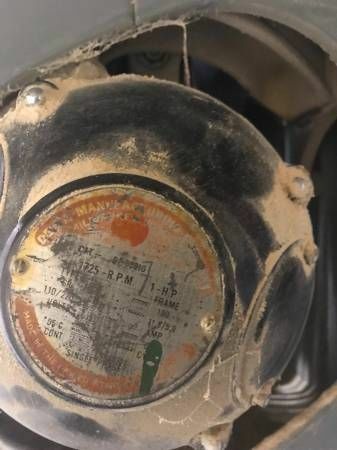 It does have an original cast iron goose egg motor cover, which is a nice find (Fun Fact – those were optional items and in 1940 it would set you back an additional $5.35 :). Ask the seller if he has the original dust door while you are at it. 1hp may be a bit on the low side, but it will allow you to run on 120v if you don’t have 240v available. Certainly a huge step up from your Dewalt. My garage is only at 110v, which makes this 110/220 option very valuable to me for a dedicated shop in the future that I can switch it too. I feel I have currently run my jobsite saw to its limits with the joinery I would like to accomplish and the tolerances it provides. I would need to take the extension table off so I can pack it way to the end of the garage, and just use the cast wings. The motor noise is also a concern. The Dewalt 748 absolutely screams. Its fine for me with ear protection, but it is very noisy in the house. I hope this Delta can eliminate some of that. He also has the original dust cover as well. Oh and also to mention, I have a 1947 6” Delta Jointer and 1950s Delta 16” scroll saw I am currently restoring now too which adds appeal. The scroll saw is actually a Delta Homecraft. Picked it up for a nice deal with full intentions of my wife using it for some craft projects, and for myself to clean out dovetails. The 6” Delta Rockwell is the only thing to really fit in my garage. Thank you all for your opinions and replies. I will be driving about an hour to pick it up. Besides checking for making sure it turns on and runs, anything else I should be aware of before handing over the money? I always go into CL purchase with some skepticism, but this one seems to be a solid purchase. The fact it has a modern switch and dust pipe, means it hasn’t just come out a barn after 20 years. The 110 volt option is convenient for me at the moment. Overall I am looking forward. Thank you again for any additional buying advice. Besides checking for making sure it turns on and runs, anything else I should be aware of before handing over the money? I always go into CL purchase with some skepticism, but this one seems to be a solid purchase. 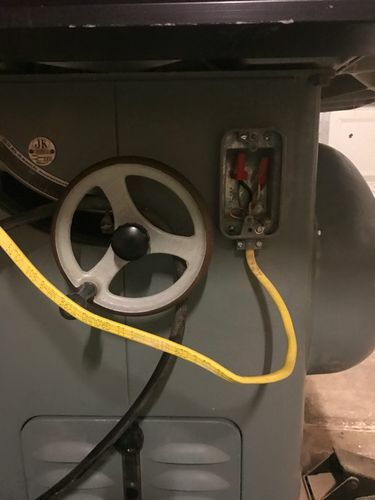 I would be hoping that the seller turned it on and it didn’t run :) That would drop the price significantly, and 99.9% of the time, it’s a stupid simple fix. 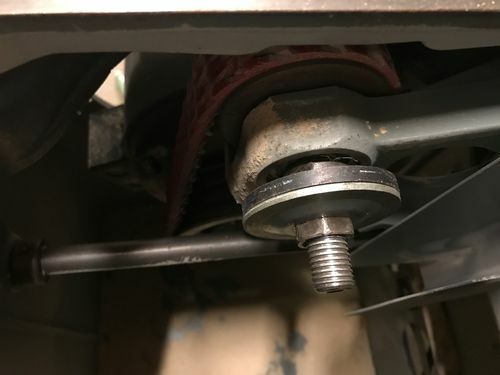 You would be amazed at some of the deals I’ve got because of a non-running motor, and every one of them was easily fixed, and without any additional cost. Just check for broken/missing stuff. You can easily clean and paint stuff that you have, and it won’t cost you anything but time/effort. But finding missing/broken stuff can really start to bite you in the wallet quick, and that super deal might turn out to not be so super. Don’t worry about hard to crank hand wheels, crunchy bearings, rusty table top or other bits, etc… rust is easy to remove, and plan on replacing the bearings and belts at a minimum, along with a good clean, lube and alignment. Thanks again guys. I drove an hour to pick it up today. Well worth the drive and I think a great value. I did not take many photos as it was getting dark but will get some in the next day or two. The seriel is 35-4684. Which I believe is 1945. It came from a cabinet shop that bought it new, with a restoration done before it went to another cabinet maker, that I just picked it up from. 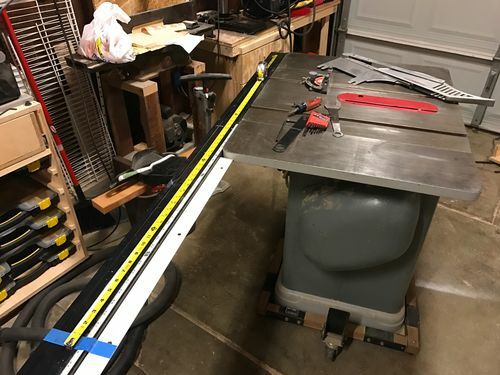 I will be in the process of shortening the rails as the 52” is way too long for my needs or even my garage. The switch to 110v will be made soon, trying to secure a good diagram or guide for me to follow. The saw has some resistance in the height adjustment but I think it’s due to some MDF buildup. While I am at it, I will have it lubed. Belts are that newer style link belt. More photos. Overall the saw is in nice condition. Paint looks original. The motor cover does not look to be original, but was painted to match cabinet. It had some nice accessories to go along with it. 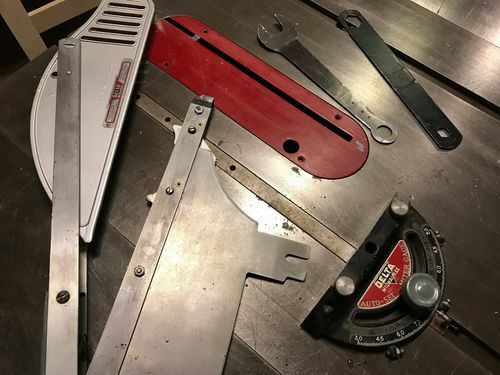 Unfortunately it does not have the bracket to hold the splitter and blade guard, I will be in the hunt for that assembly. Overall pretty happy. Need to rewire and get a new blade. Hope to have it up and running this weekend.